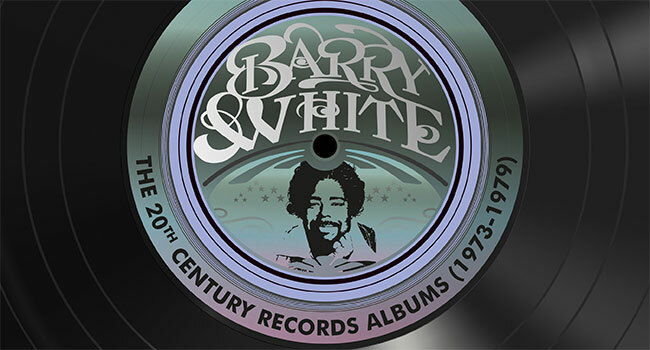 Marking 45 years since the release of his debut solo album, soul/R&B legend Barry White’s nine 20th Century Records albums have been remastered from their analogue master tapes for new 9 CD and 9 LP 180-gram vinyl box sets, titled Barry White: The 20th Century Records Albums (1973-1979). To be released worldwide on October 26th by Mercury/UMe, the new CD and vinyl collections bring together all the albums White released with the 20th Century Records label. On the same date, the nine remastered albums — all long out of print on vinyl — will be released in individual 180-gram LP packages with faithfully replicated original sleeve and label artwork. In March 1973, Barry White released his first solo album, I’ve Got So Much To Give, with 20th Century Records. Fueled by two Billboard R&B Top 10 singles, including the No. 1 “I’m Gonna Love You Just a Little More Baby,” the album topped Billboard’s R&B chart and reached No. 16 on the Billboard 200 albums chart. White’s second solo album, Stone Gon’, soon followed in October 1973. Also boasting two Top 10 R&B singles, the album’s success closely matched that of his recent debut, topping Billboard’s R&B chart and reaching the Top 20 of the Billboard 200. White’s blockbuster Can’t Get Enough album was released in August 1974. It hit No. 1 on Billboard’s R&B chart and the Billboard 200, and it also reached No. 4 on the UK chart. The album features two of White’s iconic signature songs, “Can’t Get Enough of Your Love, Babe” and “You’re the First, the Last, My Everything,” both of which topped Billboard’s R&B chart and went to No. 1 and No. 2, respectively, on the Billboard Hot 100. In the UK, “Can’t Get Enough of Your Love, Babe” reached No. 8, while “You’re the First, the Last, My Everything” topped the singles chart at No. 1. Also self-produced, White’s fifth album with 20th Century Records, Let The Music Play, was released in January 1976. It reached No. 8 on Billboard’s R&B albums chart and peaked at No. 42 on the Billboard 200 and No. 22 on the UK chart. The album yielded three charting singles, including “Let the Music Play”, which peaked at No. 4 on Billboard’s R&B chart and No. 9 on the UK singles chart. “You See the Trouble with Me” reached No. 14 on Billboard’s R&B chart and No. 2 on the UK singles chart, while “Baby, We Better Try to Get It Together” reached No. 29 on Billboard’s R&B chart and No. 15 on the UK singles chart. Is This Whatcha Wont? is White’s self-produced sixth album, released in November 1976. It reached No. 25 on Billboard’s R&B chart, with its two singles, “Don’t Make Me Wait Too Long” and “I’m Qualified to Satisfy You” respectively peaking at No. 20 and No. 25 on the Billboard R&B chart. Both singles also charted in the UK, at No. 17 and No. 37, respectively. White’s self-produced seventh album, Sings For Someone You Love, was released in August 1977. It was White’s first album since 1975 to top Billboard’s R&B chart, and it also reached No. 8 on the Billboard 200. The album features two Top 10 Billboard R&B singles: the No. 1 “It’s Ecstasy When You Lay Down Next to Me” (also No. 4 on the Billboard Hot 100) and “Playing Your Game, Baby.” A third single, “Oh, What a Night for Dancing,” reached No. 13 on Billboard’s R&B chart. The Man, White’s self-produced eighth album, was released in October 1978 on the renamed 20th Century-Fox Records label. It was his sixth Billboard R&B No. 1 and it also reached No. 36 on the Billboard 200. The album’s lead single, “Your Sweetness Is My Weakness” reached No. 2 on Billboard’s R&B chart, while White’s cover of Billy Joel’s “Just the Way You Are” reached No. 45 on Billboard’s R&B chart and No. 12 on the UK singles chart. A third single, “Sha La La Means I Love You,” peaked at No. 55 on the UK singles chart. A cover of White’s “It’s Only Love Doing Its Thing” (with the shortened title “It’s Only Love”) was a hit for the British band Simply Red in 1989. White’s ninth self-produced album, I Love To Sing The Songs I Sing, was released in April 1979. Featuring the title song, the album peaked at No. 40 on Billboard’s R&B chart. It was White’s final LP for 20th Century-Fox Records, after which he released new recordings on his own Unlimited Gold imprint. Across the nine albums he released with 20th Century Records between 1973 and 1979, Barry White established the new sound of orchestral soul that became an enduring R&B staple. Fifteen years after his untimely death in 2003 at the age of 58, The 20th Century Records Albums (1973-1979) honors and celebrates Barry White’s legendary career by restoring these classic albums and presenting them together.